The Wyche Way is a 79 mile walk connecting The Cotswold Way to The Offa’s Dyke long distance trail. 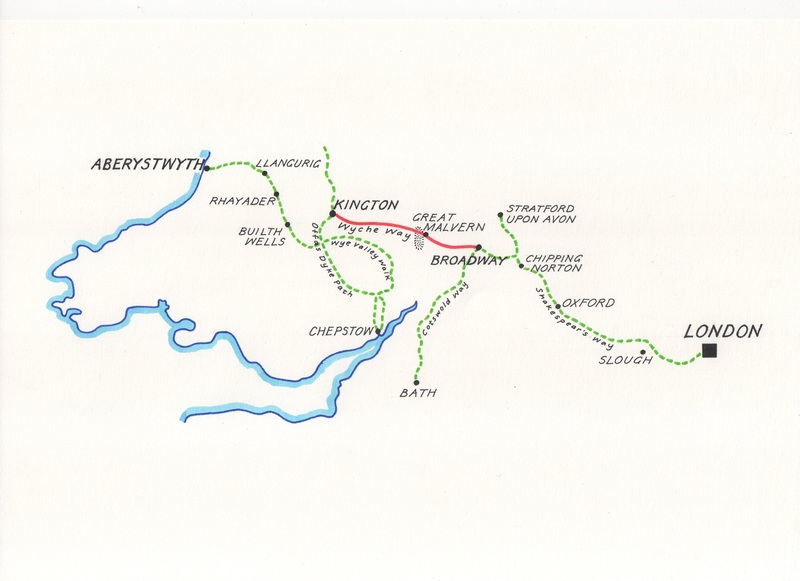 The walk starts in Kington in Herefordshire and finishes near Broadway in Worcestershire. The Second 2019 Edition of The Wyche Way is now available to buy online for £8.95. Read to the bottom of this page and click buy now. Wyche is an interesting title and one that does not appear in mainline dictionaries. Firstly I have to confess that it was not my original idea but was thought up by a leading Gloucestershire rambler, Fred Wood, in the late 1970’s. He formulated the idea for a walk that would connect up the newly established Cotswold Way from near Broadway in Worcestershire to The Offa’s Dyke long distance trail at Kington in Herefordshire. The Wyche connotation could be from ‘Which Way’ (from which of the two trails) but more importantly it was named after The Wyche Cutting through the Malverns. The cutting itself was used by packhorse transport in the middle ages for salt from Droitwich to South Wales. ‘Wich’ and it’s derivations all have connections to salt producing areas ie Droitwich, Middlewich and Nantwich. Fred Wood had organized the walk into a considerable number of circular day walks which took several years for Cheltenham Rambling Club to walk, but as soon as I heard about it , I thought it would make a really good linear walk in maybe six reasonable stages. I was greatly helped on the whole project by Jim Mason, who is a councillor in Winchcombe, and is also involved with The Walkers are Welcome initiative which the town promotes and which we also discovered was common to Kington. We soon decided that it would be better to reverse the original direction of the walk and to start at Kington. This way we started with three easy stages before climbing over The Malverns and then proceeding on to Bredon Hill and finishing at Broadway Hill. After our initial walkover we walked the whole trail with Cheltenham Rambling Club in 2013 at which we discovered that Stage 4, which started at Fromes Hill, and finished at Upton on Severn, and included crossing the Malvern ridge, was rather long for a group to undertake in a day. We had not previously taken this stage down into Malvern town centre, but then the importance of Malvern for promoting the walk, and the extra availability of accommodation and transport made it more important. We therefore shortened Stage 3 and finished this at the attractive village of Bishops Frome, which allowed us to make Stage 4 finish in Malvern with a challenging new bit of route over North Hill. Stage 5 was then another shorter stage back over the Malverns and down to Upton on Severn via the Wyche cutting. The last two stages were unchanged from the original but the trail is now suggested as 7 stages with just over 80 miles. There are great contrasts throughout the walk with firstly the Herefordshire villages including quite a lot of the old black and white houses. There are then the numerous cider orchards before The Malverns are reached which have more 1000 feet peaks in a concentrated area than anywhere else in southern England. Two major rivers are crossed as the route continues on through the Vale of Evesham and then up onto The Cotswold escarpment. This is an easy going stage with a possible lunch stop at The Bells pub in Almeley which also houses the village shop. The route is then mainly through agricultural countryside before reaching The Leys, a fine old house with Elizabethan origins. The route then enters Weobley, which is famed for it’s many black and white buildings, by a circular route past the earth banks of Weobley Castle. Weobley has several good pubs as well as shops, accommodation and bus links to Kington and Hereford. Another easy going stage but with a climb up in the morning to Westhope Common and then fine views over to The Black Mountains. The route continues along a fine ridge before descending down to the Queen Elizabeth Country Park with it’s Arboretum and a large café with a good range of reasonably priced food. The Malverns are glimpsed ahead as the large village of Bodenham is soon reached. The England Gate pub has accommodation as well as a good menu. There are bus services to both Hereford and Leominster. This is the last of the flatter stages but there is still plenty of interest with an old Roman road being reached which is now a long distance bridle path and then an interesting woodland enterprise where a couple are marketing timber products in Moreton Wood. A good lunch time stop can be taken at Little Cowerne church where the route briefly coincides with The Three Choirs Way. There are later two possible routes through to the attractive village of Bishops Frome of which we recommend the one with far less tarmac! Bishops Frome has two pubs and a good community village shop. This stage has the most ascent on the whole trail but is full of variety. It begins with a steady ascent up to Fromes Hill passing the attractive Cheyney Court on the way. It then passes through undulating countryside to reach Mathon Church with it’s ancient Yew tree which makes for a good picnic spot. The route then climbs up Cockshoot Hill before descending down and across to West Malvern. There is then a last climb up to North Hill which can either be over the top or around on a contouring path. The route then zigzags it’s way around the hillside to emerge at the top of the town. There is no shortage of places to stay and many restaurants and good pubs. The railway station is close to hand and there are local bus services. There is an initial stiff climb up to St Anns Well, with it’s tempting café, but then the route is slightly more gentle as it contours upwards and across to The The Worcestershire Beacon which is the highest point on The Malverns. The route continues along the ridge, ducking and diving through gorse bushes, to eventually drop down to The Wyche Cutting. Just below in the Colwall direction is The Malvern Hills Geocentre which houses the H2 café whilst through the Wyche Cutting is The Wyche Inn. Walkers are spoilt for choice! The route then starts descending through attractive woodland to eventually arrive at the main road by Malvern Wells. Now on the flat, the route is through a succession of fields and passes the edge of Hanley Swan before arriving at Hanley Castle with the idiosyncratic Three Kings pub. It is then just a couple of miles alongside the river bank to Upton upon Severn. Again there are several good pubs, lots of accommodation and a good range of shops. The route out of Upton soon crosses the River Severn and then passes through agricultural countryside and the villages of Ryall, and Naunton. The attractive village Green at Upper Strensham makes for a good morning refreshment stop before crossing the motorway and reaching Strensham Marina. The River Avon is then crossed by a series of spectacular metal board walks. Soon after the large village of Eckington is reached with the smart Bell Inn a welcome sight. Soon after the village the prominent tower is seen up ahead on the skyline and after reaching Woolas Hill Farm with it’s Deer Park, the path steepens and eventually arrives up on the ridge with level walking up to Parsons Folly which is the correct name of the tower. The route then follows the escarpment for nearly a mile before turning south east and descending all the way down to the church in Ashton under Hill. There is some B&B accommodation in the village as well as the pleasant Star Inn. There are bus services to both Evesham and also Cheltenham. The route initially passes through The Vale of Evesham which is famous for it’s market gardens and in particular asparagus. The attractive village of Dumbleton is soon reached with it’s lovely cricket ground and new pavilion and then after crossing the newly restored Honeybourne railway line the superb village of Stanton is also reached. This is classical Cotswold style with mellowed stone cottages, some being thatched. The splendid Mount Inn sits at the top of the village, where, whilst enjoying a drink or food one can look back over to The Malverns, and on a fine day, over to The Black Mountains. There is a stiff climb after lunch up to The Cotswold Way and then beyond to the equally attractive village of Snowshill which also has another good Donnington brewery pub. The route continues up hill but then levels out to continue along a quiet road to firstly, reach The Broadway Country Park with it’s excellent tea shop, and then very soon after Broadway Tower. This also has some refreshments and for a fee it is possible to climb up the tower, read all the history over the last two centuries, and admire the view over six counties. This is the official end of the walk but there are several options left. One can turn left just after the tower and descend down on The Cotswold Way (south direction) to the lovely village of Broadway where there is plenty of accommodation, pubs, shops and local bus services. The nearest train station is at Evesham. Walkers can also continue on the Cotswold Way (North direction) for a mile or so to Fish Hill where there is a free car park (locked at night), and where they can be collected by friends or arrange for a taxi. Walkers doing the whole Aberystwyth to London route would probably continue on The Cotswold Way to Chipping Campden (3 miles) where there is more good accommodation and services. If you would like to find out more about The Wyche Way, please contact me via this page. The second 2019 edition of The Wyche Way is now available to buy for £8.95. Just click on the Buy Now button below. Lovely to see this initiative of Fred Wood being used. I remember well collecting him and his partner in crime on some of the later stages into Herefordshire. They were always late, always laughing and full of excuses as to why they were late; attractive barmaids and missing footbridges being amongst them ! Thanks for what looks like a perfect walk for me. I’ve been looking into a way to walk between my two favourite places, Stratford upon Avon and Hay on Wye, and assumed I’d have to plan the entire route myself. But apart from adding a day at the start and one at the end, I’ll be able to do the whole trip on this route. And I was really keen to go via Malvern so I’m thrilled! Good to hear from you and delighted that The WW suits your planned walk. Just a few things to say – Firstly, I cannot see an Anna on recent book sales so maybe you bought the book from one of the different stockists I supply? Secondly – Which end are you planning to walk from? and that may depend on where you live. Of course the route is only way marked in the one direction. Apropos the bit back to Stratford – you wouldn’t need to walk from Chipping Campden through to near Little Rollright to meet Shakespeare’s Way since you can easily find footpaths from CC through to Shipston on Stour and then join SW back to Stratford. At the other end The Offa’s Dyke Path from Hay to Kington is really straightforward and when I did it some 20 years ago it was an easy day walk- about 13 miles from memory. Do let me know how you get on and I shall be only too pleased to help with any queries you might have. To get from Broadway to Stratford, I have followed the Cotswold Way to Chipping Campden then Heart of England Way through Mickleton and round Meon Hill, then Monarch’s Way which takes you into Stratford from Long Marston along the old railway line. This last bit (now a paved cycle path) is a bit boring but at least it’s straight! The earlier part of the walk is mainly farmland, with the attractive town of Chipping Campden and village of Mickleton and some good views. Looking forward to walking this sometime soon. We live near the Cotswold Way and have walked most of it at one time or another, and have just completed Offa’s Dyke Path. So a walk connecting the two sounds about right!